How do I create a GPS waypoint for an address? I’m trying to use my Garmin NUVI 350 along with your software. 1. able to punch in multiple locations like 60-80++ addresses in the US at a time and be able to see those locations on my computer. 2. those 60-80++ addresses need to be transferred to my NUVI 350 that way I can triangulate the locations and go to those locations with the route already set from computer. 1. Is your software capable to do those 2 things I would like to do? 2. If yes, where can I find the user guide how to do it on your software? How to Convert Street Addresses to Waypoints for my GPS? 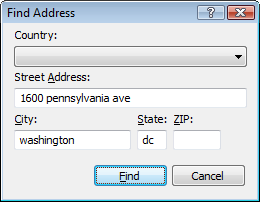 The process of converting street addresses (1600 Pennsylvania Ave, Washington, DC) into GPS waypoints with latitude and longitude (38.89859, -77.035971) is called geocoding. ExpertGPS has a built-in geocoder, the Go to Address command on the Help menu, which can geocode addresses in the United States, Canada, and dozens of other countries throughout Europe and Asia. Just click Go to Address on the Go menu, type in the address, and press the Find button. ExpertGPS will convert the address into a latitude and longitude that your GPS can understand, and the map in ExpertGPS will jump to show the address you entered. Then press Waypoint to create a GPS waypoint at this location. The second part of your question asked if it was possible for ExpertGPS to create routes to these addresses that your Garmin nuvi 350 could follow. ExpertGPS can create routes and send them to Garmin, Magellan, Lowrance, and Eagle GPS receivers. Unfortunately, Garmin has removed the routing capabilities from its low-end nuvi GPS receivers. The Garmin nuvi 350 and other 200 and 300-series nuvis can’t record GPS tracklogs, and they can’t follow a route sent from the PC. For this, you’d need something like the Garmin nuvi 750.